We have some amazing new arrivals at t+j Designs! (seriously...check them out!) 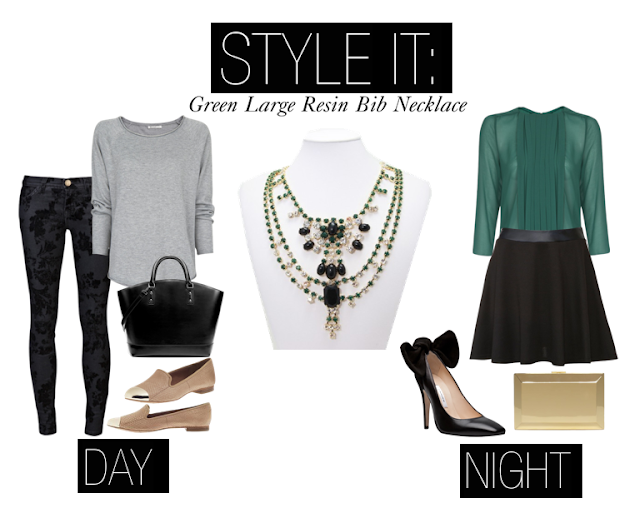 My favorite new piece is this large bib necklace that comes in emerald and cobalt. It is a perfect statement piece and so interesting! (Definitely a conversation starter) This piece is so great but I could also see it being a bit overwhelming at first glance if you are not sure how to style it. Luckily, I created a Style Guide for this lovely necklace & I am showing you how to rock it, day or night! This piece may seem too big or bold for day, but I love the idea of pairing your favorite basics with a statement necklace like this to vamp up your day to day style. I chose to pair it with a basic grey long-sleeve from MANGO and these Current/Elliot Black Flora Ankle Skinny's I've had my eye on. Complete the look with a simple day bag, like this one from Zara. And don't forget the on-trend "smoking slippers"! I love this metallic toe style from Sam Edelman! For the night time look, I wanted to focus on the gorgeous Emerald hue in the neck piece...after all...it is officially Pantone's Color of The Year for 2013! I decided to marry an emerald sheer paneled blouse with a flirty circle skirt from New Look. You can add tights if you'd like! A little bit fuller of a skirt helps to balance out the focus in the necklace & paneling details on the blouse. Finally, I finished this look with feminine bow detailed pumps from Carven (how perfect are those?!) and a simple gold metallic clutch from Kate Spade for a little shine. Would you rock this statement bib necklace? 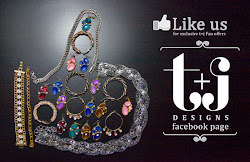 What other gorgeous new arrivals from t+j Designs do you need help creating looks with?